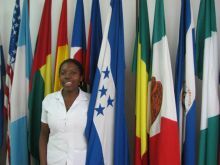 HAVANA, Mar 19 2010 (IPS) - At the age of 17, Meybelin Bernárdez is clear about the future: “When I finish my studies, I’ll return to help my community get on its feet,” the young Garifuna woman from Honduras, who is studying medicine in Cuba, says without hesitation. Her mother, whose skin is as dark as hers, taught her that the most important thing in life is to study. “But a poor black girl like me couldn’t even dream of being a doctor without this scholarship,” she tells IPS. Bernárdez belongs to the Garifuna ethnic group, descendants of African slaves who survived the sinking of two Spanish galleons off the coast of the Caribbean island of St. Vincent in 1635, where they intermarried with members of the local Carib tribe. The Garifuna are estimated to number around 600,000 in Central America, the Caribbean, Mexico and the United States today. Bernárdez’s words summed up the reality faced by the large majority of black women and girls in Latin America – although there are more and more who are actively rebelling against the role of victim of racial discrimination. In Colombia, Rosmira Valencia, director of the Network of Women from Chocó says it is women who worry about the education of their children, even at the cost of great sacrifice. “Today, at the University of Chocó, women make up a majority of the students, who are studying and training for a better future,” she says. Although it is rich in natural resources, the northwest Colombian Pacific coastal region of Chocó, where nearly all of the population is black, is the country’s poorest region. “Women are strong, and we are sure that we will achieve our big challenges: to influence the development of our region, strengthen the sense of belonging and continue moving forward in the search for equality and respect,” Valencia said. The declaration also recognised the need to adopt a gender perspective in policies, strategies and programmes of action against racism; protect women suffering aggravated discrimination on the grounds of racism and gender discrimination; and develop a more systematic and consistent approach to evaluating and monitoring racial discrimination against women. But nine years later, little to nothing has changed for women of African descent in the region, according to activists and leaders who spoke to IPS in different countries ahead of the International Day for the Elimination of Racial Discrimination, observed on Mar. 21. On that day, in 1960, the police opened fire on a peaceful demonstration by black protesters in Sharpeville, South Africa against apartheid “pass laws”, which restricted the movements of blacks in the country. Sixty-nine people were killed and some 200 wounded in the massacre, which marked a turning-point in the history of South Africa and the start of growing international isolation of the segregationist regime, which finally collapsed 30 years later. Thanks to the Colombian constitution of 1991,”we began to be noticed as part of society. But we are still quite invisible, even after Durban 2001,” said Valencia. Statistics provided by Nicaraguan activist Dorotea Wilson, head of the Network of Afro-Latin American and Afro-Caribbean Women (RMAA), indicate that 80 percent of the more than 150 million people of African descent in the region are still living in poverty and have few opportunities to improve their situation, because of racial discrimination. Blacks in Latin America also suffer forced displacement at higher than average rates, and young black males are treated as criminals and often killed “in a kind of genocide in the guise” of fighting crime, said Wilson, whose movement is active in 24 countries. To illustrate, she cited the case of Nicaragua, where according to official data the highest maternal mortality rate is found in two Caribbean coastal regions where most of the population is indigenous or black. In these regions, maternal mortality is 373 deaths per 100,000 live births, compared to 63 per 100,000 live births in 2009 according to the Health Ministry (or 170 per 100,000 live births according to the New York-based Human Rights Watch). Wilson said the limited progress made in terms of making the movement for the rights of blacks more visible and putting the issue on the public policy agenda is basically due to the work of civil society organisations, particularly the women’s movement and human rights groups. Cuban writer, theater critic, and cultural historian Inés María Martiatu emphasised the ground gained by black women in the region in terms of organising, with a view to “full insertion into society in order to achieve economic independence. “Afro-Latin American women rebelled against slavery; they lived as escaped slaves and took part in the struggles for independence. They did not remain stuck in the role of victim; what happened is that history was written by others, and now this is coming to light little by little,” said the Afro-Cuban writer. In her view, black women in Cuba took advantage of the opportunities offered by the 1959 revolution, as shown by their presence in areas like education, health, science and culture, although they have not escaped discrimination based on the colour of their skin. “For years the official line maintained that there was no racism or racial discrimination (in Cuba). But now it has been acknowledged that black women have lost time,” Martiatu said. “The reality is that prejudice, racism and discrimination exist…and are expressed even within families, whether black or white,” she said. The issue of race is currently the focus of a debate in Cuban society, but Martiatu and other Cuban intellectuals agree that a gender focus is missing. “There is still a long way to go. The solution, which lies in education and awareness-raising, is a long-term goal,” Martiatu said, although she expressed her confidence in the new generations. “Racism isn’t solved by socialism or capitalism; it’s more complex and profound than that,” she stated. “Some academics have been working on these issues, and have managed to spark debate on them, running counter to arguments that the discussion and analysis should be postponed,” she said. *With additional reporting by Helda Martínez (Bogotá) and José Adán Silva (Managua).